If the Israeli Embassy (London) website is anything to go by then Israel is really feeling isolated in the world. The Israeli Embassy proudly trumpeted the launch of its new website recently (http://london.mfa.gov.il). 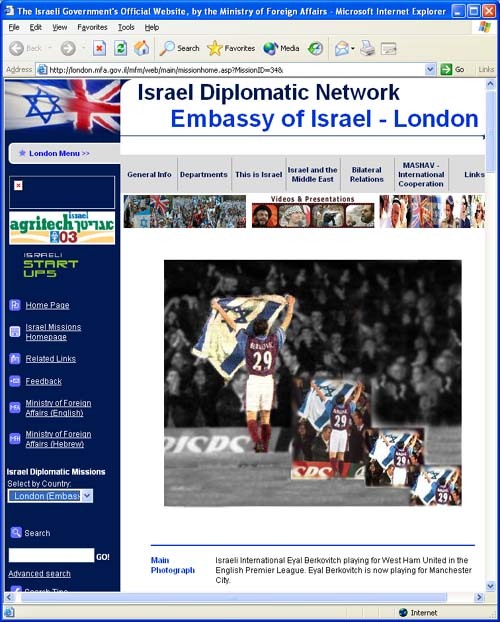 Its front page is splashed with a photo of Israeli footballer Eyal Berkovic in West Ham kit embarrassing the British crowd by waving an Israeli flag. The photo is ancient - at least 4 years old - Berkovic no longer even plays for West Ham - his last game was in 1999. For the embassy to dredge up such an old photo the cultural boycott of Israel must really be hurting...ouch! "Berk.. if you're gonna pull out a zionist flag from your underwear during a West Ham game then at least have the decency to burn it!"